Welcome to Ohio 4-H Robotics! You’ve chosen a fun and challenging project that puts you on the exciting path of robotics programming. Ohio 4-H offers a series of two robotics projects, both using LEGO® Mindstorms® EV3 technology. If you complete these projects and are ready for something more, check out our Robotics Master! If you already have the an NXT set, you can continue to use it and the related project books by accessing them below and completing a self-determined project. It is also possible the NXT projects are being offered in your county. Check your county's project guidelines for additional information. Use the newest LEGO® technology to learn about what a robot is, how to build one, and how to program it. 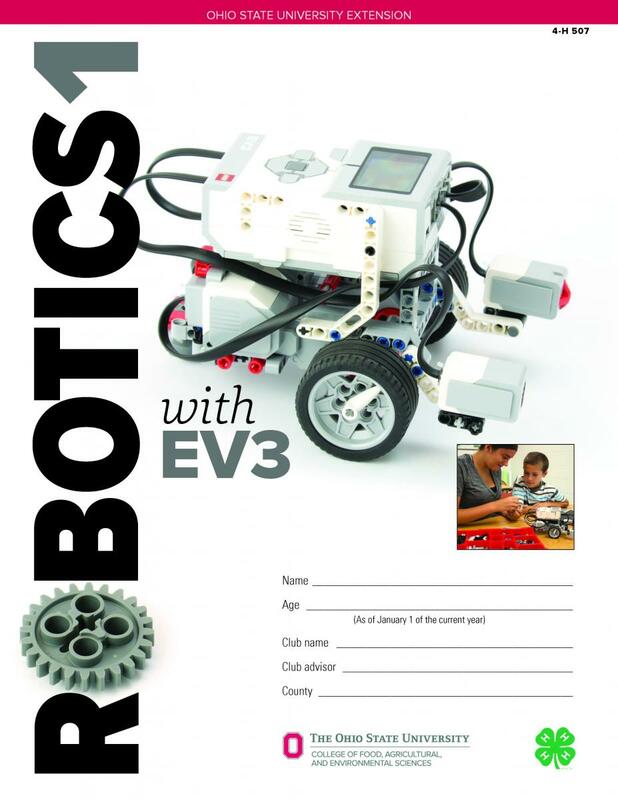 Activities are based on the EV3 Core Set available from LEGO® Education. (Careful, other EV3 kits may not be the same! See below for details.) This is the first in a series of two books. 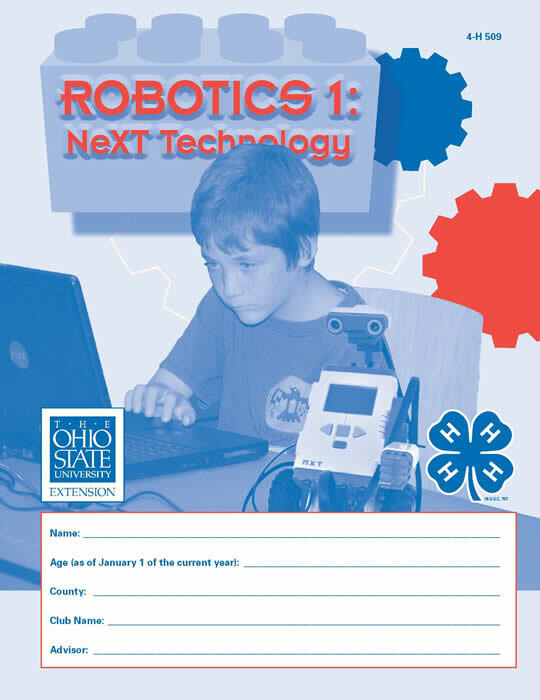 Project book 507 Robotics 1 with EV3 is available in Ohio State University Extension county offices, through Media Distribution's eStore, and in the National 4-H Mall. Ohio residents get the best price when they order and pick up their purchases through local Extension offices. Sample pages and ratings are available on Project Central. Youth need access to a computer and high speed internet. Files and videos that support the activities are available HERE. 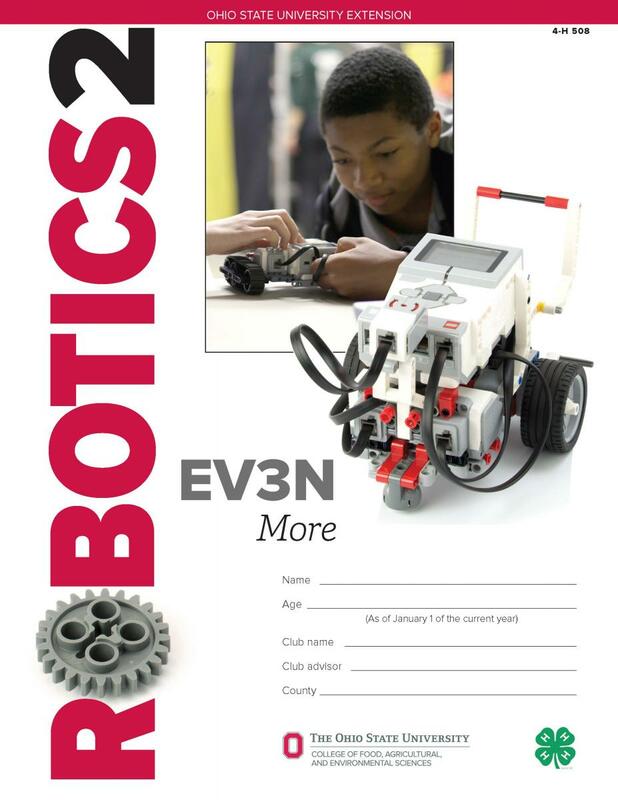 Project book 508 Robotics 2: EV3N More is available in Ohio State University Extension county offices and through Media Distribution's eStore. Ohio residents get the best price when they order and pick up their purchases through local Extension offices. Sample pages and ratings are available on Project Central. Youth need access to a computer and high speed internet. Videos that support the activities are available HERE. Ready to buy an EV3 kit? Why buy direct from LEGO® Education when other, less expensive sources for kits are out there? Be sure to read Retail vs. Education EV3. The newest technology from LEGO® Mindstorms® uses "EV3" technology. If you are buying a kit for the first time, buy this latest. We strongly recommend ordering the EV3 Core Set (comes with software) directly from LEGO Education. This special bundle includes everything needed for the project, and then some: the kit, software, rechargeable battery, a storage bin, and live support. Be careful! Other commecially available kits typically do NOT include everything needed to complete the project. Have a question or need help with your EV3 kit purchased from LEGO Education? FREE technical support is available by calling 866-349-5346. If you're a robotics master . . .
Members who have completed these projects and who want to continue the fun are encouraged to design their own self-determined robotics projects with the Robotics Master. Still interested in an NXT project? Robotics 1: NeXT Technology is available for free download HERE. This intermediate project covers robotics basics. Youth learn what a robot is, how to build one using a LEGO® NXT kit, and how to program a LEGO® robot to interact with its environment via touch, sound, light, and ultrasonic sensors. Youth need access to a computer and high speed internet. Files and videos that support the activities, developed in partnership with the Carnegie Mellon Robotics Academy, can be accessed by following the instructions below. Thank you Carnegie Mellon! Robotics 2: NeXT Steps is available for free download HERE. This advanced-level project guides youth through new robot configurations and programming challenges with activities in the book and instructional videos online at the Carnegie Mellon Robotics Academy. The LEGO® NXT robot constructed for Robotics 1: NeXT Technology is required. (No new LEGO® purchase is necessary.) Youth need access to a computer and high speed internet. Files and videos that support the activities, developed in partnership with the Carnegie Mellon Robotics Academy, can be accessed by following the instructions below. Thank you Carnegie Mellon! Are you doing an NXT project and using an NXT kit? 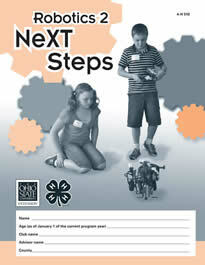 Project helpers and 4-H members still can access the NXT Video Trainer 2.0 from Carnegie Mellon Robotics Academy. Reference the trainer for instructional videos and a wealth of other robotics resources. For 509 Robotics 1: NeXT Technology: A one-to-one correspondence with the activities in Robotics 1: Next Technology is no longer available. However, all of the skills are covered under the Basics and Behaviors tabs in the NXT Video Trainer. By exploring these two areas and constructing your robot as shown, you will complete the learning covered in this project. For Robotics 2: NeXT Steps: The videos referenced in Robotics 2: NeXT Steps are available under the Advanced tab in the NXT Video Trainer exactly as they are referenced in the project book. SuGO competitions combine the idea of sumo wrestling and LEGO Mindstorms. It is possible to use EV3 software (and the EV3 project books above) with an NXT brick and kit, though the experience is not ideal. The light sensor programming does not work correctly. Illinois 4-H offers a solution on the last slide in this Light Sensor Addendum. To see if there is an active robotics group in your area, please check with your local county Extension office. A complete list of offices is available HERE.